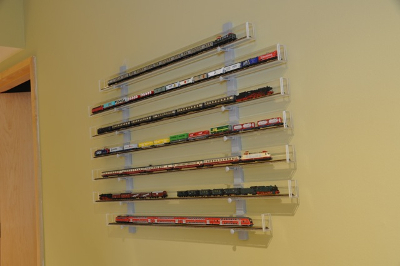 WAWIKO is a practical and inexpensive system for the display of your trains which consists of acrylic tubes with optional wall brackets. 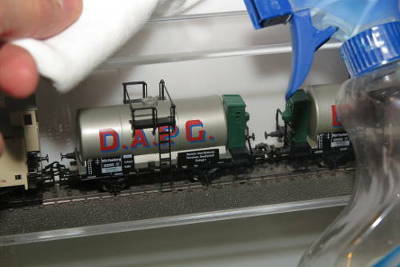 The trains are protected against dust, well presented and easy to display or to remove via means of coupling to your model railway layout. 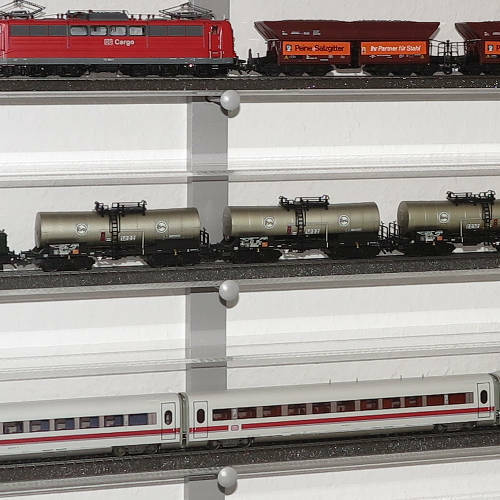 In future there is no need to hide your valuable trains in boxes or in the lower level of your layout. Free your layout of some rolling material to be able to drive more freely once again. 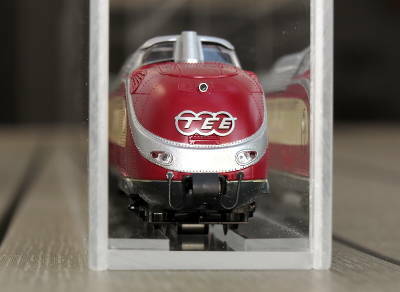 Both sides of the tubes are locked with transparent gates, which run in deep milled tracks. Breaking through of the trains is impossible! 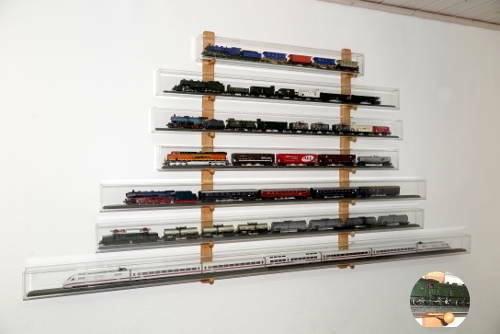 The acryl tubes are delivered without tracks, so you can select the tracks system of your choice. 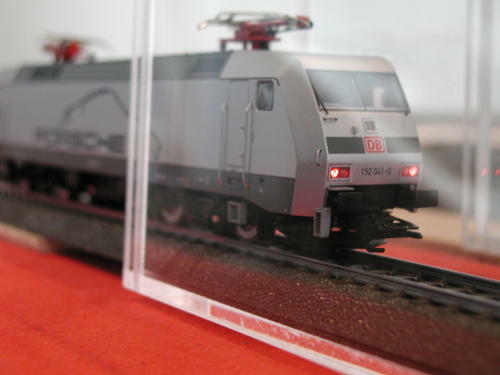 It is our opinion that to the presentation of a train belongs also a visible track bed. As the experience shows, it is not necessary to fix the track to the tube, but it can be done very easily. You can order all length ot tubes for the price of the next standard length. Tubes with an unlimeted life period? 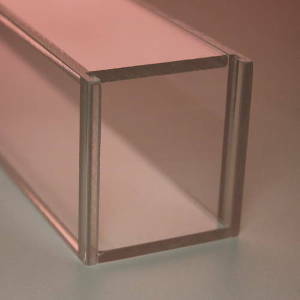 Our tubes are made of a strong acrylic material with a material thickness of 4mm. The tubes are welded together and therefore very durable and “bend secure”! 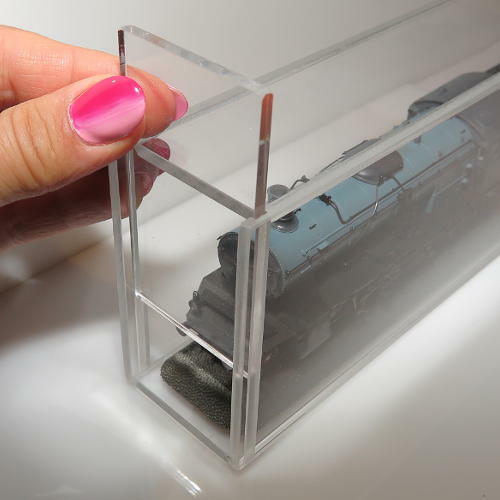 We use high quality acrylic material! As a result of our outdoor tests the last 15 years, we estimate indoors an unlimeted life period with cristal clear material. are manufactured from plastic-coated aluminium profiles and available in a silver-grey colour. The tubes come to rest on robust fastened bolts. The wall holders are equipped with three holes to fix them to the wall. Wall fixings are included in the delivery. The wall holders are also avaliable made of finished beech wood. We use a natural product based on citrus for the finish. Easy transport with two kitchen papers at both ends. 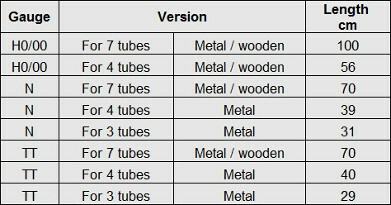 The prices are the same as the prices of the normal tubes. Please order this dust protection tubes with a note in the comment field. 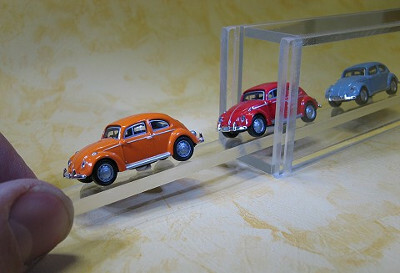 Scale H0 – cars in a scale N tube. The cars are mounted on the slats with glue pads. Please order this accessory with a note in the comment field. 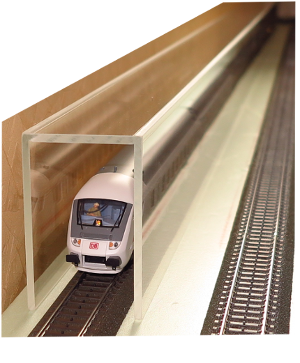 If you don't want to equip your tubes with expensive tracks so we have two alternative solutions to stabilise the trains with flatt acrylic slats. It is necessary to mount the slats with short strips of transparent double-sided self-adhesive tape (7,5m) 2,50 €. Please order "middle-slats" with a note in the comment field. 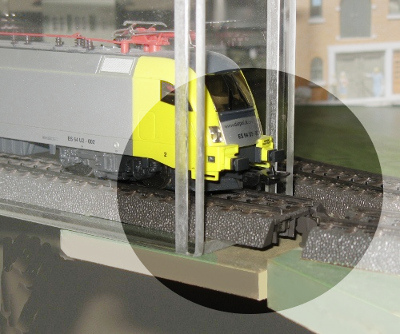 The two slats are the better solution for trains with sliders. It is advantageous to mount the slats with short strips of transparent double-sided self-adhesive tape (7,5m) 2,50 €. Please order "side-slats" with a note in the comment field. ... also for pulse tilts. Especially rail car trains have sensitive couplings. So it's better to transport the train en bloc with WAWIKO-Tubes. Mr Seiler is using weathered and grassed tracks to present his trains. Mr. Aumüller is using wooden slats which are laminated (wallpaper paste) with backdrops. 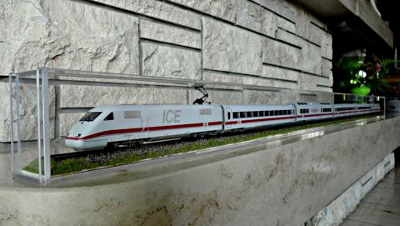 The slats are positioned between the trains and the backside of the tubes. Do you like to do handicrafts? Then it's a lot possible to lighting the trains. It's also recommendable to use LED ceiling spots to lighting the whole Showcase to reduce shades and to see your trains in the true colors. 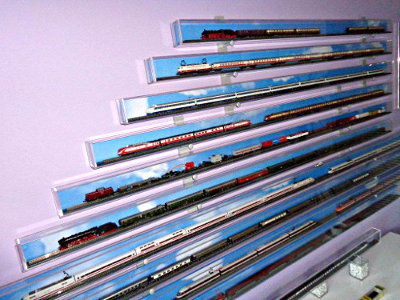 You see a N gauge system (tubes 90 cm and 112cm). My wife said; Wow, that looks like an work of art. Perhaps we should buy more of this.... .... and that after she was against the showcase in her flat. Clean or take dust off with a slightly moist cloth (with window cleaner). Small scratches on the display can be removed with the polishing agents freely available on the market. For deep scratches, first wet-sand with the enclosed special sandpaper (grain 2500) and after this use chrome polish. You need at least 2 wall holders. 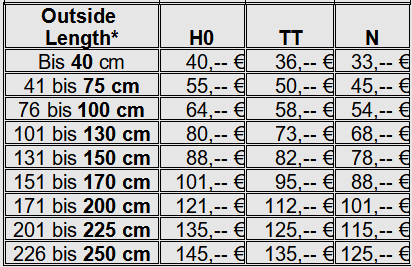 The shipment costs outside of Germany are depending on the destination. Please ask for an attractive offer. Please order here via E-Mail: wawiko@wawiko.de"
- do you also need wall holders? Data supervisory authority: Der Landesbeauftragte für den Datenschutz und die Informationsfreiheit Baden-Württemberg, Königstrasse 10 a, 70173 Stuttgart. Personal DataWAWIKO takes the protection of your personal data very seriously. Therefore we treat your personal data very confidentially and with the greatest possible care. Your privacy matters to us, please do take the time to get to know our practices and if you have any questions, contact us. The use of our website is usually possible without the input of personal data. Insofar as personal data are collected on our website (e.g. name, address, E-Mail) this will as far as possible always be on a voluntary basis. No personal data will be forwarded to any third parties without your express consent. We draw your attention to the fact that data transmission on the internet (e.g. through Email communication) may involve gaps in security. How we use the information that we collectIn general we will only use the personal data provided by you to answer your questions, to handle your order or to provide you access to certain information or offers To maintain customer relationships it may also be necessary for us to store and process personal data to be able to respond to your business needs more effectively and to improve our products or services; or for us (or a third party on our behalf) to use this personal data, at your request, to contact you about our offers or to conduct surveys to be able to better meet the requirements and demands of our customers. Of course we will respect your wish if you do not want to provide us with your personal data in order to support us with our customer relationships (in particular for direct marketing and market research). Your personal data will then not be sold to a third party or marketed in any other way We will only collect, use or disclose the personal data you provide online for the special purpose unless the disclose is to be used for a purpose directly related to the original purpose for which the personal data was collected, is necessary to prepare, negotiate or fulfill a contract with you, is required by law or the responsible governmental or judicial authorities, is necessary to protect a legal claim or for defense in the face of legal action, or is necessary to prevent improper use or any other illegal activities, such as willful attacks on us. Safety WAWIKO implements technical and organizational security measures to protect your personal data against unintentional or unlawful deletion, alteration or loss as well as unauthorized disclosure or access. Permission for the collection and storage of your data can be revoked at any time with respect to subsequent services. You can revoke permission for the collection, processing and use of your personal data at any time with respect to subsequent services. In this case, please contact us via the address specified in our imprint or via wawiko@wawiko.de. Personal data is deleted if you revoke permission for its storage, if your personal data is no longer required for the purpose for which it was originally stored, or if storage is no longer permissible for other legal reasons. This does not affect data required for billing and accounting purposes, or that has to be stored for legal reasons. Cookies We use no cookies. Contact For information, suggestions and complaints regarding the processing of your personal data, please refer to the contact address specified in our imprint. Should incorrect information be stored, despite our efforts to ensure that the data stored is accurate, we will correct this information at your request.